Rev3Quassy was our first Key Race for the 2013 season…and it was a doozy! Tons of climbing and high temperatures conspired to really test our early season fitness and preparation. It was awesome to spend the weekend with TeamEN folks and to see so many of them ripping it up on race day. As the largest online triathlon team, we are constantly on the search for ways to connect our members in the real world, hence the 2013 Key Race series. We had over 30 athletes from as far away as Canada compete in both the Olympic and Half Rev events, the picture above is before the Half Rev on Sunday. This was my first Rev3 event and I was seriously impressed. It was a great atmosphere with some of the friendliest, nicest volunteers & staff I have seen in a long time. The setup was very professional, from registration to transition to the finish line and expo. The location at Quassy Amusement park was key so that my kids could have some post race fun too. I definitely recommend this event as a fun, accessible and challenging early season test for your Ironman…or just for a great weekend. While I haven’t been in peak training mode — I usually race a Half just before or just after an Ironman® — I was looking forward to a challenging day of racing. Turns out that while some parts of my game were ready, quite a few were not — I had an average day of racing for me with lots and lots of lessons learned for the rest of the season! Packing was a disaster…I had little focus and ended up bringing everything with me. Seriously. And I still managed to forget critical gels and a few other things. That said, I really had a blast hanging with the Team at our lunch event…we totally took over the second floor! A special thanks to the spouses who put up with all of our trigeekery! Race morning had me up, fed and onsite by 5:15. Which was good because my row-end space was all jacked up. The rack to hold my bike was broken and USAT officials helped me relocate to a new space…right next to a good friend so I was all set. Made it to the car and back in time for the mandatory Team photo. Considering I had only swum 5 times before the race, I was a bit nervous. I managed a five minute warm up, which was critical. The gun went off and I was a bit too far back…after about 8 minutes of panicked swimming, I resolved to get back to 4 count breathing and the long stroke that works for me in the pool. The result? I swam incredibly straight and had a great swim. The swim was one of the biggest positives for me on the day. With more climbing in 56 miles than two loops of the Lake Placid course, I knew that it was going to be a tough ride. There were tons of really steep hills, including a six-mile doozy from miles 23 to 29. Of course this is where I decided to drop my chain. I noticed early on that my legs felt a bit heavy or flat. I resolved to start fueling up and things came around after about 30 minutes. It became clear to me early on that my decision not to change my gearing on my bike was an issue…I was really struggling to keep momentum over the hills. I was running a 12-25 and could have used a 27 back there, or a compact crank. In fact my cadence was 77 for the 250, and most of it not by choice. This was partly caused by a funky shifting issue when in my small ring that made it very hard to use all my gears. I knew this going in and decided to ignore it. As a result, I worked way too hard on some sections just to keep moving, and then couldn’t keep the effort up in other areas when it would have been advantageous. Without the dropped chain and the right gears, I could see going 2:35 to 2:40 on this course. Nutrition Stats – Note I successfully peed at mile 20. After the bike I knew the run was going to be hard simply due to how hard I had worked. Unlike the bike I had actually previewed the course so I knew just how hard it was going to be. I made a point to fuel up in the first 3 miles before the hills started. And they were epic. 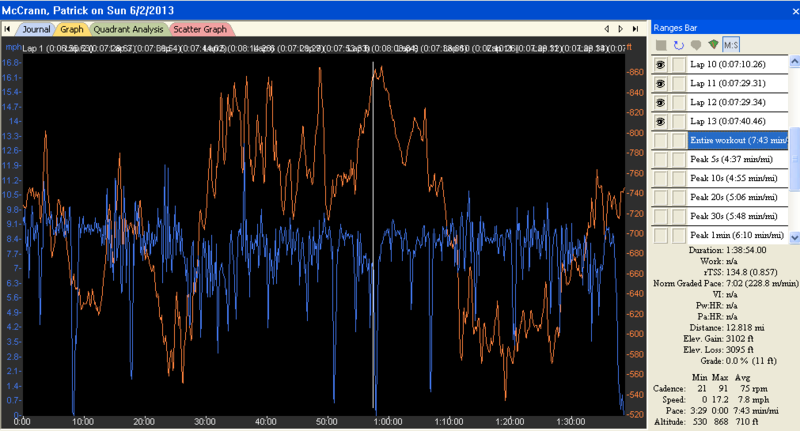 In the image above the orange line is elevation and the blue is speed. You can see my speed dropped all day (typical) but all those sharp blue drops are all the walk breaks I needed to take to keep my heart rate down. 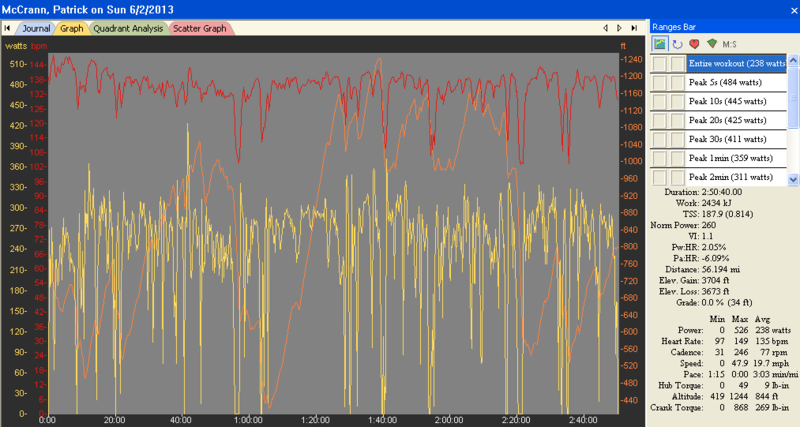 I don’t have my HR synced with my Garmin, so it’s not in the graph…but it was super high. Basically I had boogered the bike pacing part and I was paying the price for it here on the run. I was happy with my run time considering the situation, but I can definitely be faster with smarter execution. This was a super important race for me, as it has really put me back on track to race smarter. I learned a ton from the experience, and look forward to putting it into play in my next event…which I need to find now for some redemption. Congrats to everyone who raced!